First Friday night stage will bring Rock, Blues and two Steve’s! Steve Kellam to co-host Friday evening.. This year the festival begins on Friday the 8th of July…The evening is set to be full of Rock and Blues..and two very well known Steve’s will be hosting the evening. Those of you that listen to Borough Blues on a Friday evening (Monday’s from 4th July) on Radio Ashford, will know Steve Kellam’s passion for the Blues. He is well known within the Ashford music scene and is a big supporter of local live music. Steve is also involved heavily backstage throughout the weekend with the Castle Inc team, and has done for many years. We are extremely thankful for all his support, and are very much looking forward to the first Friday night! I caught up with Steve and asked him a few questions about local music, the festival and his involvement. Simple really, it’s all about Ashford, as a local Breakfast DJ keeps reminding us. It’s great to see the people of Ashford coming together for something that is free for them to enjoy and organised by local people. You are no stranger to helping organise a Festival, tell us a bit more about your involvement this year? Actually I’m somewhat lacking this year. Normally would be helping out on the stage with loading and unloading gear, but as, most people know by now, a bad shoulder injury last year has put paid to that. I’ll still be there, doing anything I can to help, or just getting in the way. No seriously, I’m sure there will be plenty to do between bands etc. We have a great team that run the stage for Edward led by the mighty (though not in stature) Guy. We’re all members of Castle Inc. and just as importantly we’re all good mates as well. You know what I’m going to say here, for me there is nothing better. Both my Boy’s Jack and Liam grew up playing sports including Rugby (My sporting passion) and Cricket. In later years Jack has gone to be, for me, and yes I know I’m bias, a good Musician, especially as he shares my passion for Blues. Liam has gone onto become a really good Chef. They have both worked hard, sorry I’m wavering from the question, proud and all you know. Live music is essential, I believe in a young person’s development. Playing live, no matter what standard promotes confidence and a sense of achievement as well, that can spill over to everyday life I believe. What can we expect from the Martin Judd stage this year? Tell us a bit more about the line up? As has been documented by know Friday night opens the festival for the very first time. It’s really fitting and emotional that Edward has decided to remember Martin in this way. Martin was a big fan of this festival and headlined with his band Live n Kickin. Had a few beers with him in the past behind stage at the end of the night. Great memories of a great man. My main duties to be honest is co-hosting Friday with the Ashford legend in his own lifetime Steve Monk, from Ashford Rocks. Martin Judd’s other band Legacy open the proceedings of the Friday special, Rock and Blues night. Their followed by the superb, Joe Green’s Blues Explosion. Joe Green maybe a new name to a lot of Ashford people, but trust me when I say, he’s a phenomenal Blues guitarist. 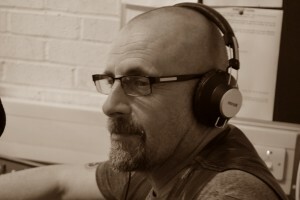 Joe will be coming in to join us on Borough Blues on our new Monday night slot on the 4th July on Radio Ashford. Headlining Friday night the one and only Slam Cartel, I love these guys. A great Rock band, with a very charismatic front man in Gary Moffat. The band, comprise of JC Cothias (Lead Guitar), Steve Campkin (Drums) and Marc Neudeck (Bass) along with Gary Moffat (vocals), Terence Warville (guitar). On a personal note Terry is one of the nicest guy’s you could meet. Really helped me out over the years with various projects I’ve been involved with. The rest of the weekend see’s some old favourites returning and a few new one’s as well. It is set up to be a fantastic weekend of music and arts from people of Ashford, for the People of Ashford and you know what even if you are not from the Borough, come anyway, it’s going to be a memorable year I reckon.